Untuk film 1925, lihat Ben-Hur: A Tale of the Christ (film 1925). 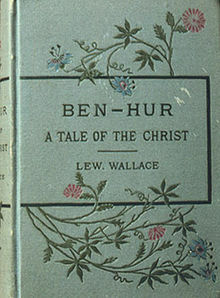 Ben-Hur: A Tale of the Christ adalah sebuah novel karya Lew Wallace terbitan Harper and Brothers pada 12 November 1880, dan dianggap "buku Kristen paling berpengaruh dari abad kesembilan belas". Novel tersebut menjadi novel Amerika berpenjualan terbaik, menyalip Uncle Tom's Cabin (1852) karya Harriet Beecher Stowe dalam hal penjualan. Wikimedia Commons memiliki media mengenai Ben Hur. Ben-Ari, Nitsa (2002). "The Double Conversion of Ben-Hur: A Case of Manipulative Translation" (PDF). Tel Aviv University. Diakses tanggal 2014-10-01. Ferraro, William M. (June 2008). "A Struggle for Respect: Lew Wallace's Relationships with Ulysses S. Grant and William Tecumseh Sherman After Shiloh". Indiana Magazine of History. Bloomington, Indiana: Indiana University. 104 (2): 125–152. Diakses tanggal 2014-09-09. Hezser, Catherine (2008). Ben Hur and Ancient Jewish Slavery. A Wandering Galilean: Essays in Honour of Sean Freyne. Brill Academic Publishers. Diakses tanggal 2014-10-01. Lifson, Amy (2009). "Ben-Hur". Humanities. Washington, D.C.: National Endowment for the Humanities. 30 (6). Diakses tanggal 2010-04-20. Miller, Howard (June 2008). "The Charioteer and the Christ: Ben-Hur in America from the Gilded Age to the Culture Wars". Indiana Magazine of History. Bloomington: Indiana University. 104 (2): 153–75. Diakses tanggal 2014-09-27. Swansburg, John (2013-03-26). "The Passion of Lew Wallace". The Slate Group. Diakses tanggal 2014-10-01. Wikimedia Commons memiliki media mengenai Ben-Hur: A Tale of the Christ. Halaman ini terakhir diubah pada 8 November 2018, pukul 13.46.